Nothing matches the warmth and beauty of natural wood countertops. 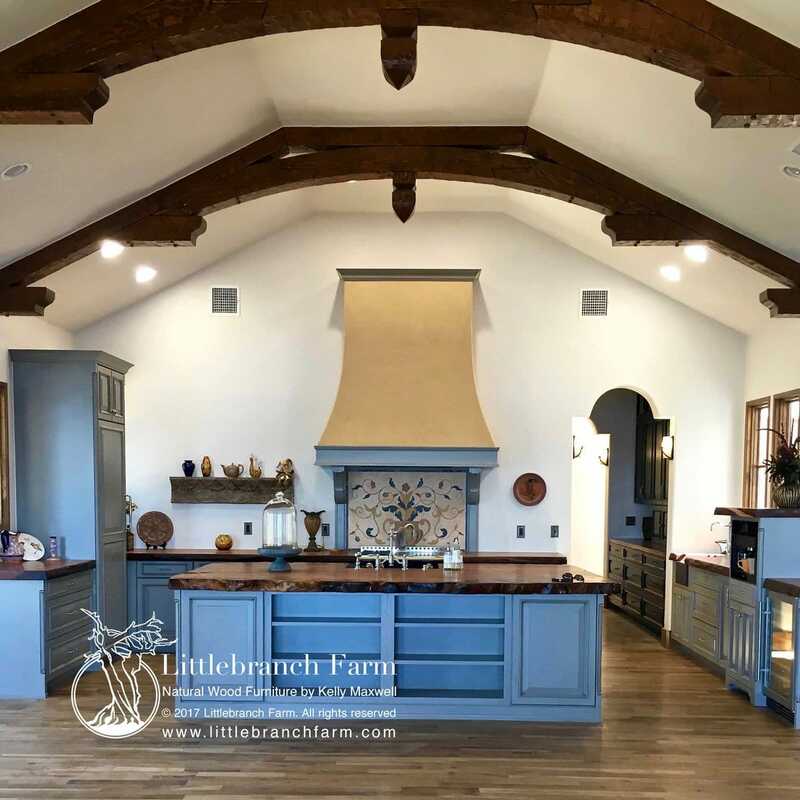 Whether it is a wide plank wood countertop or is accented with a natural live edge wood slab, natural wood countertops will complement any home decor. 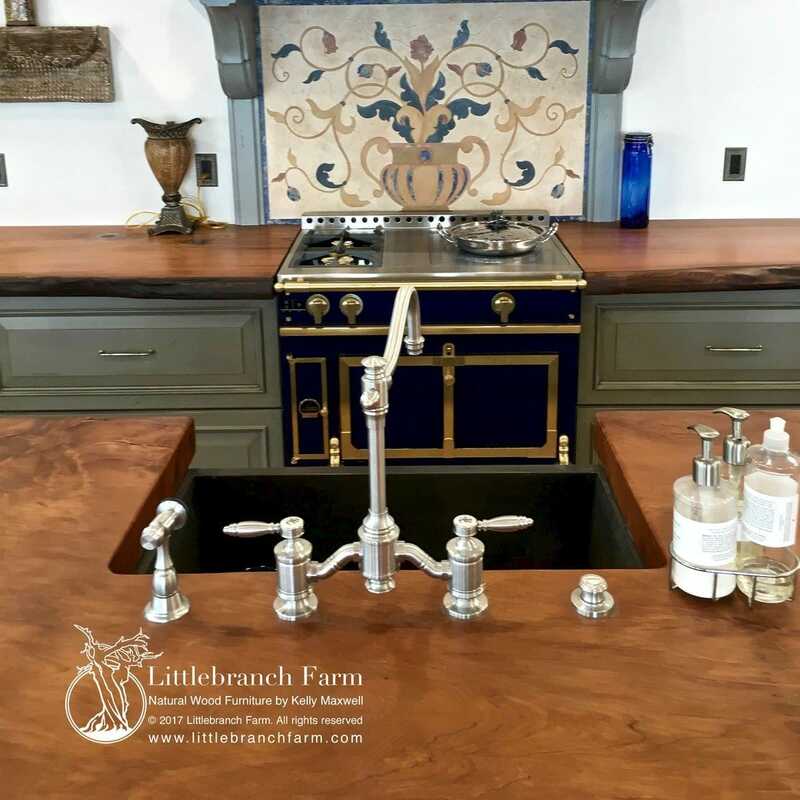 The natural wood grain patterns of knots, curl, and marbling combined with the rich color tones make it a game changer as a countertop. 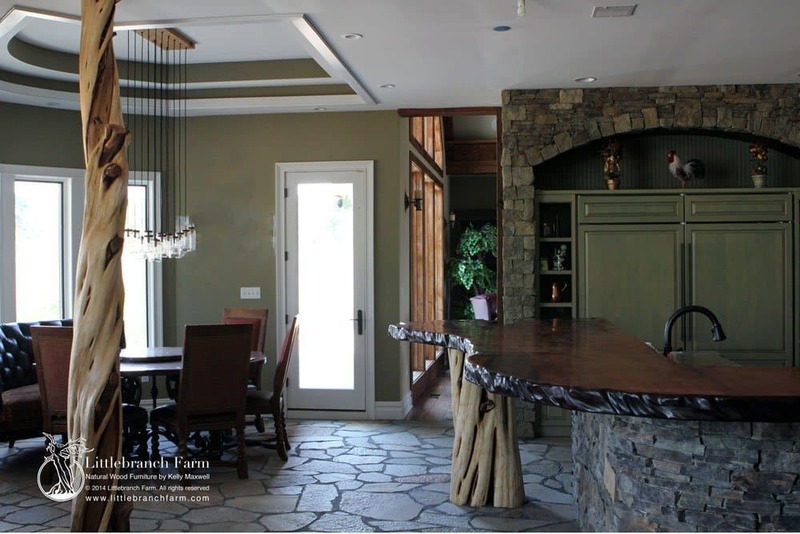 With the change in design trends from manufacturers and heavy stone to the natural warmth of wood shines through. Thus softening the industrial stainless steel. 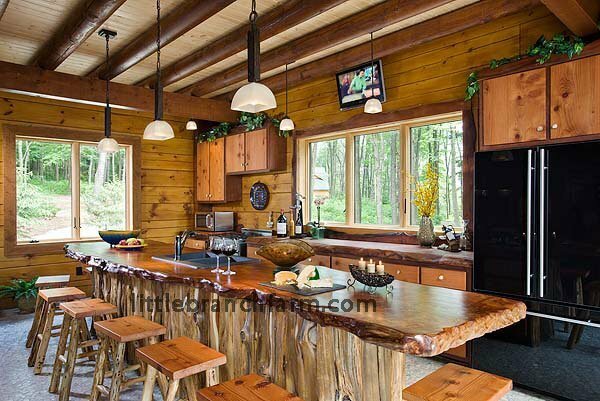 This elegant kitchen features live edge countertops made from salvaged old growth redwood wood slabs. 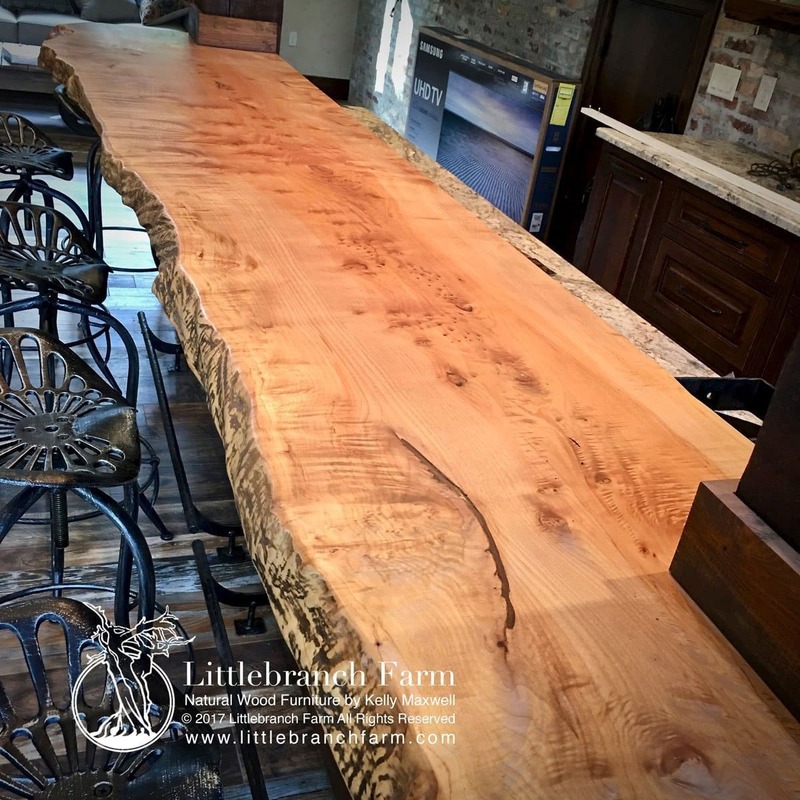 This live edge wood countertop is an ethically sourced Bigleaf maple wood slab. It features a natural edge and color tone. Another custom wet bar features a wood countertop with a natural raw edge. The live edge wood complements by warming this home decor. 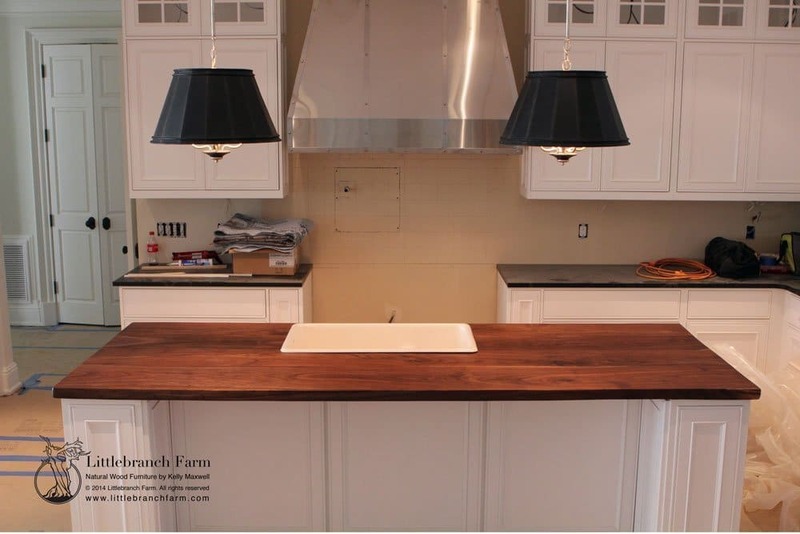 For centuries butcher block countertops have been used in kitchens. 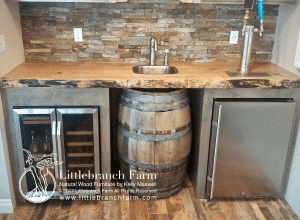 These are achieved by gluing strips of wood together to craft a butcher block countertop. This style is also available in end grain and wide plank. 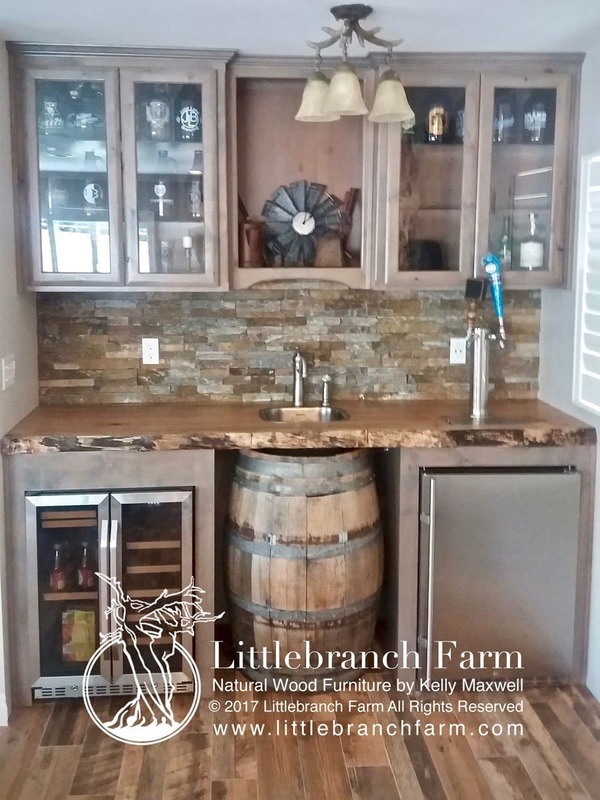 There are several options in wood species like maple, walnut, cherry, hickory, and beech. These are all found commonly in your local lumber yard. They also come in a variety of thicknesses. 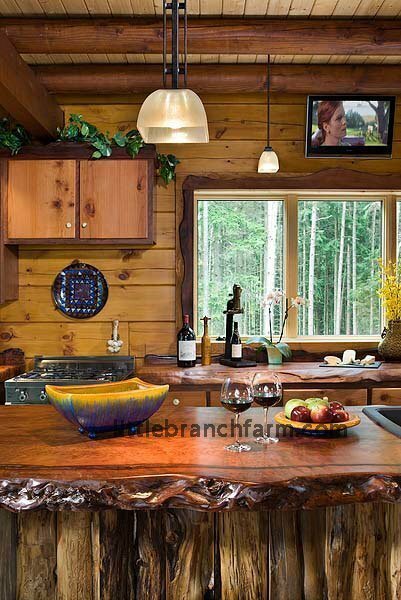 The natural beauty of handcrafted real wood countertops made from old growth redwood! 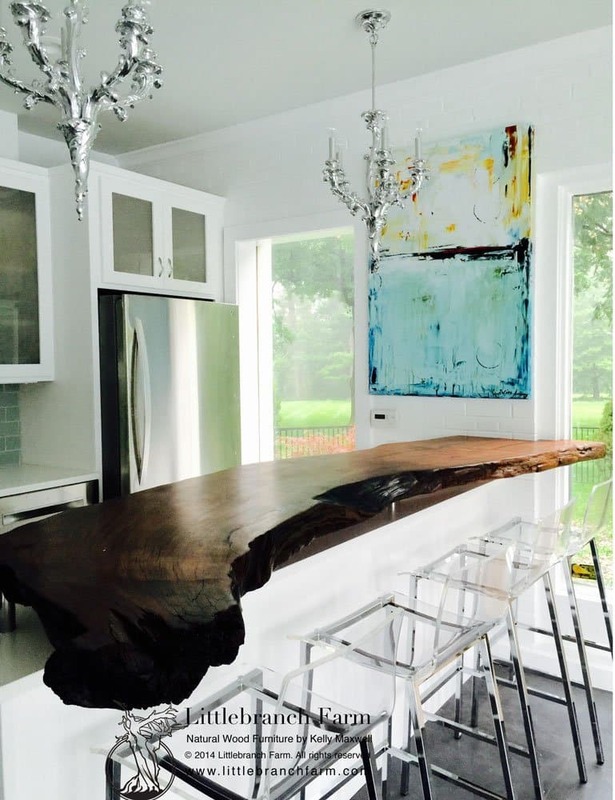 Wood slab countertop crafted from ethically sourced black walnut wood slabs with an organic live edge. 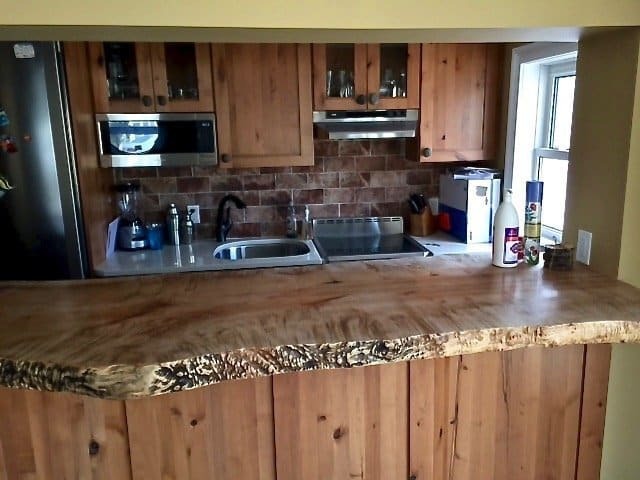 Custom designed and crafted floating live edge wood slab countertop. 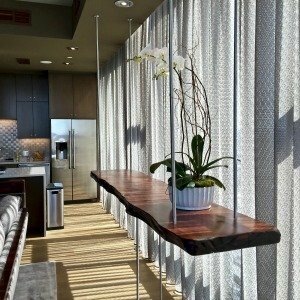 This custom wood furniture piece features an old growth redwood wood slab suspended with brushed nickel rods. Rustic meets modern in this Nashville, TN penthouse! 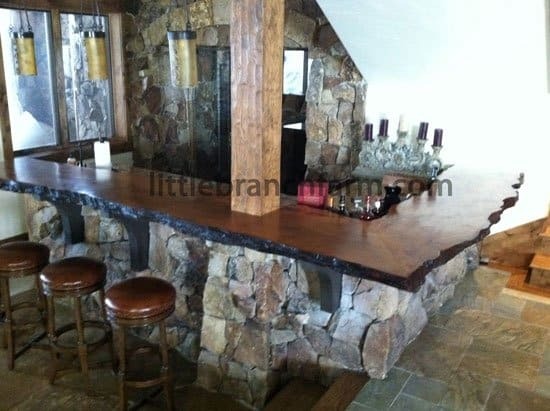 Another example of a bar style rustic wood countertop built out of a live edge bigleaf maple wood slab. 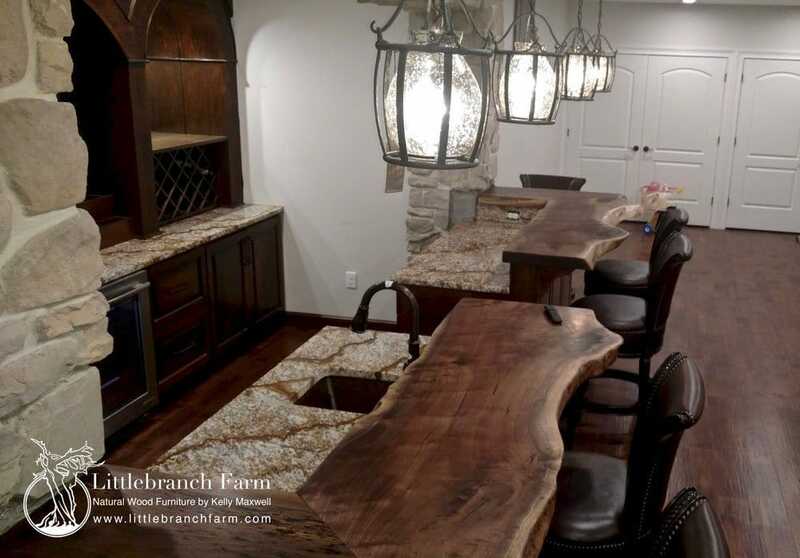 We specialize in natural wood countertops that are crafted using ethically sourced live edge wood slabs. Our wood slabs are milled from dead standing trees or trees and root system left on the forest floor. Most of our wood is harvested from the pacific northwest. We offer maple, black walnut, redwood, elm, claro walnut, western juniper and other incidental trees. We look forward to working with you. The process is a simple email or call our studio in Nashville Tennesse to walk through the process. 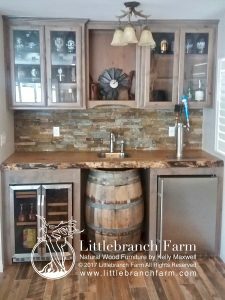 Clean and elegant Black walnut live edge bar top. 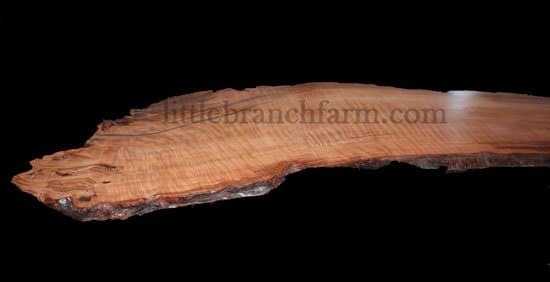 Bigleaf Maple bar top crafted using a live edge wood slab. Simple but elegant bigleaf maple live edge wood bar top ready to install. 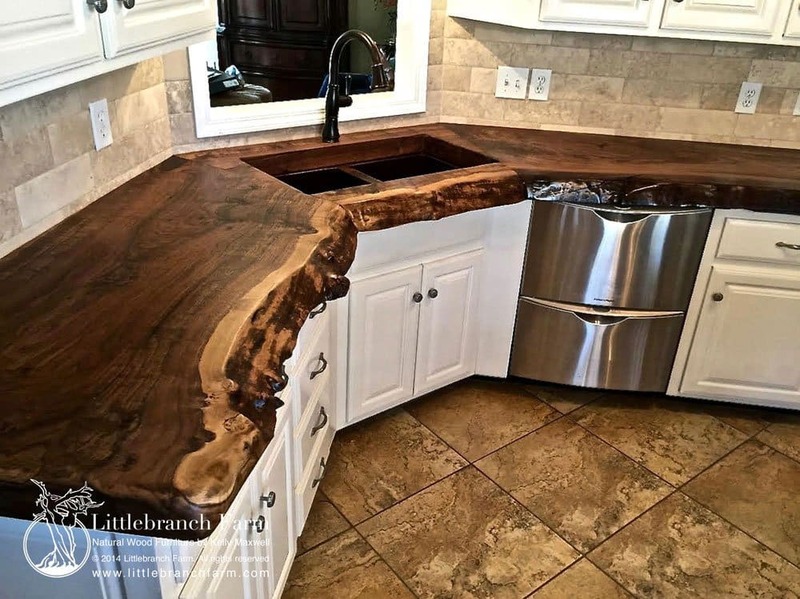 Live edge wood countertop. 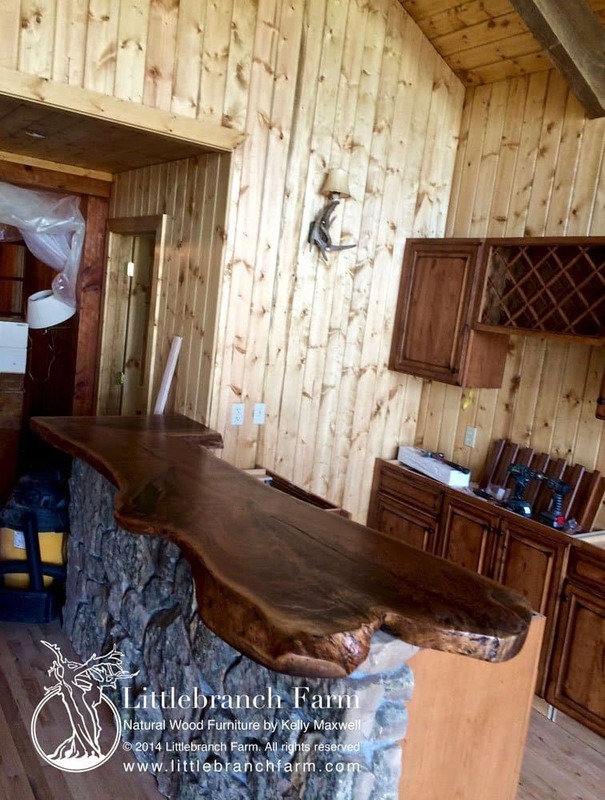 This 10′ x 6′ custom island top is one solid salvaged old growth redwood raw edge wood slab. 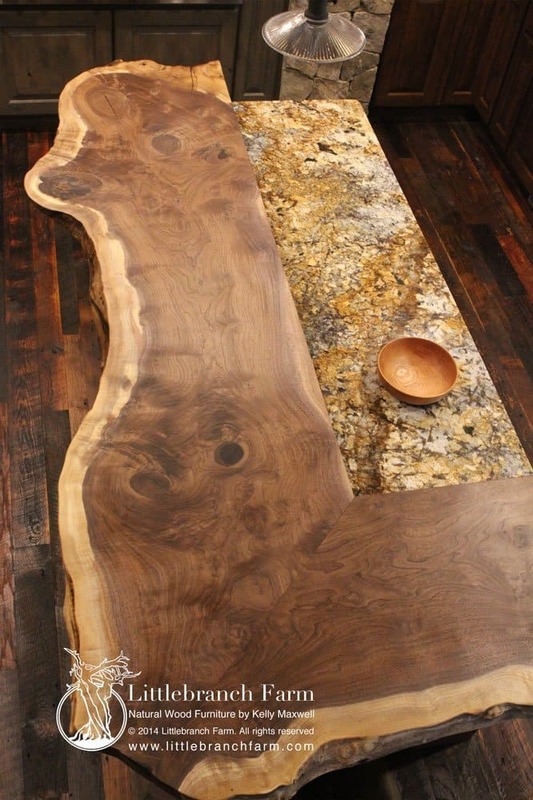 Bigleaf maple burl wood slab countertop. Featured in it home at UMD in Cine Hall. 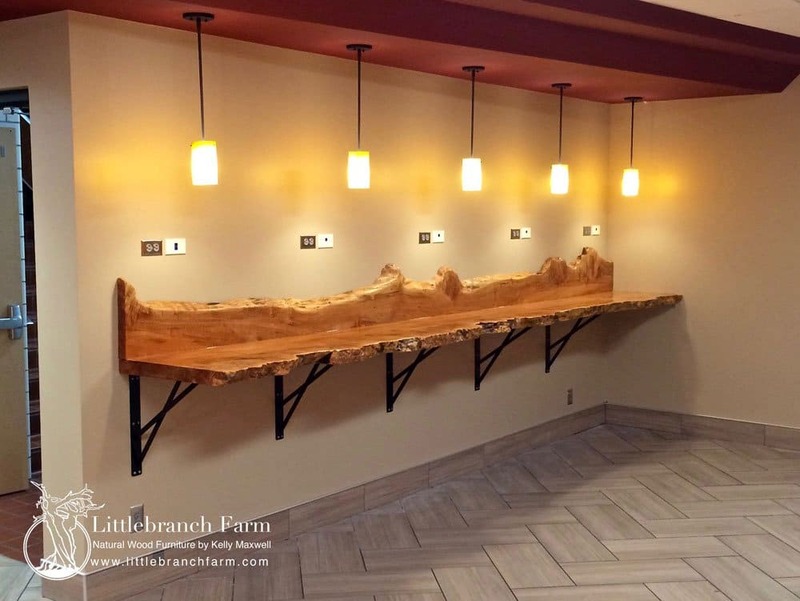 Live edge wood slabs custom crafted to meet our client’s needs. Features the rich colors and wood grain patterns found in claro walnut. 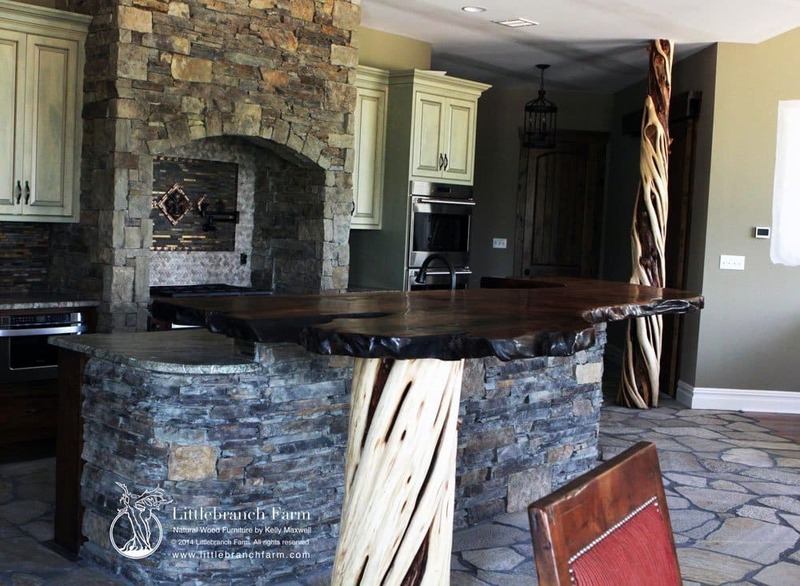 Custom natural wood countertop with twisted juniper columns. This elegant kitchen decor highlights an old growth redwood raw edge wood countertop. Live edge countertop crafted from Claro walnut. We can custom craft these to meet your needs. 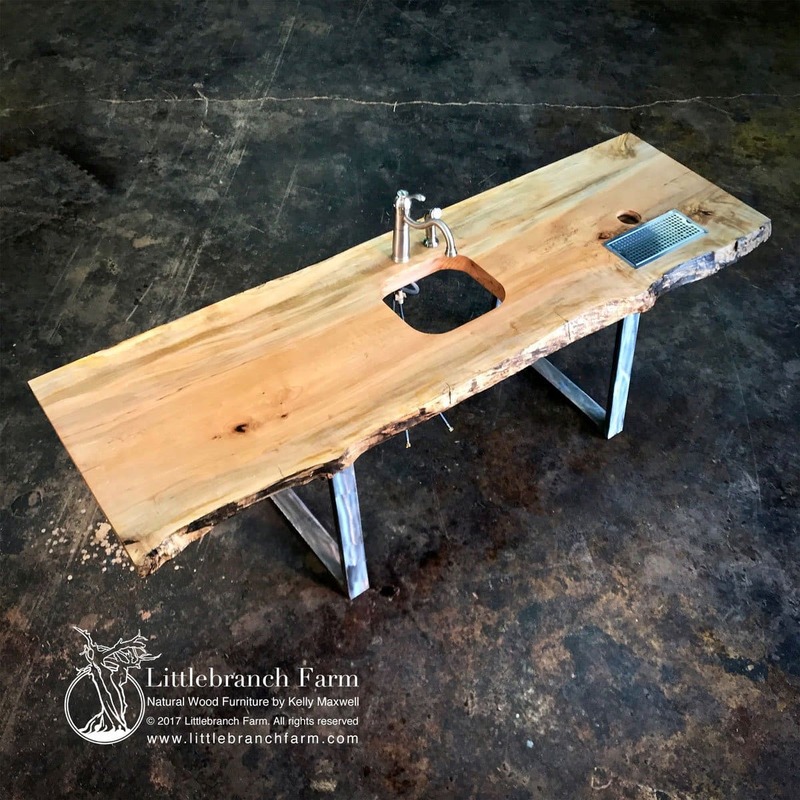 This unique wood countertop features 3″ live edge wood slabs. It can be found at a Nashville, TN bar on 5th ave south. Black walnut wood slab bar top. Handcrafted using ethically sourced live edge wood slabs native to the USA! 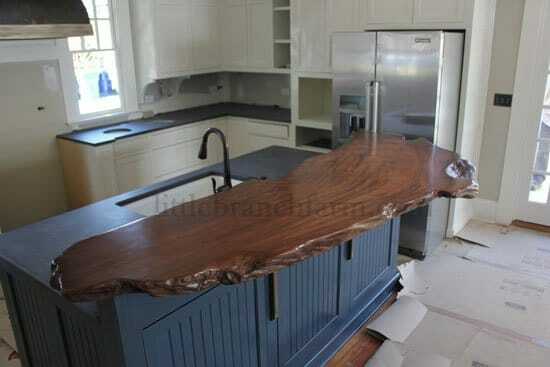 Redwood Live edge wood slab natural wood countertop. 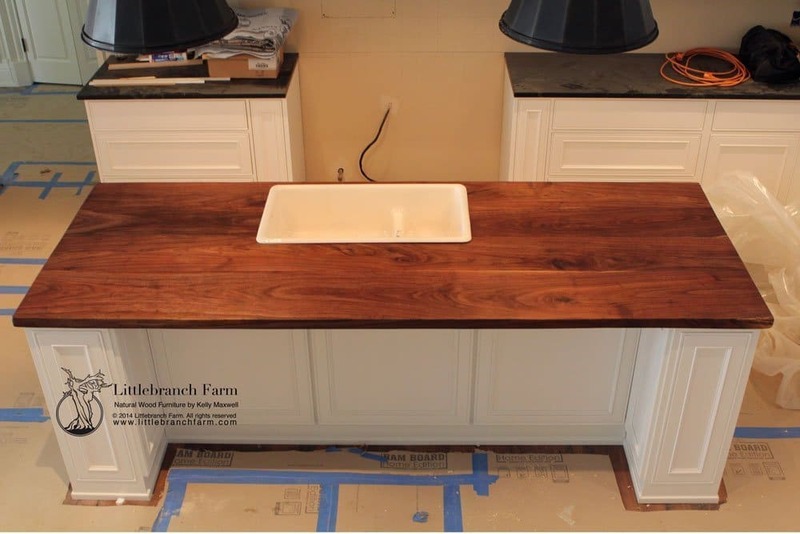 Butcher block wood countertop feature wide plank black walnut and food safe finish. 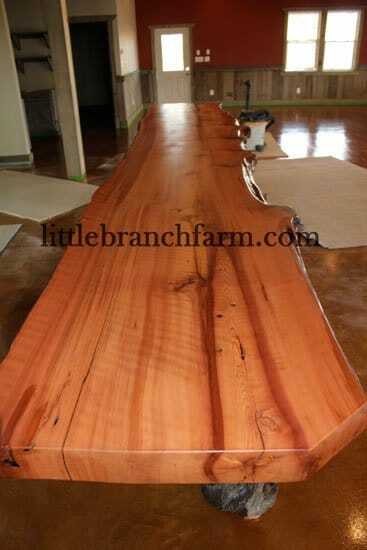 Live edge wood slab countertop crafted from reclaimed old growth redwood. Twisted juniper accent column. Rustic modern kitchen! 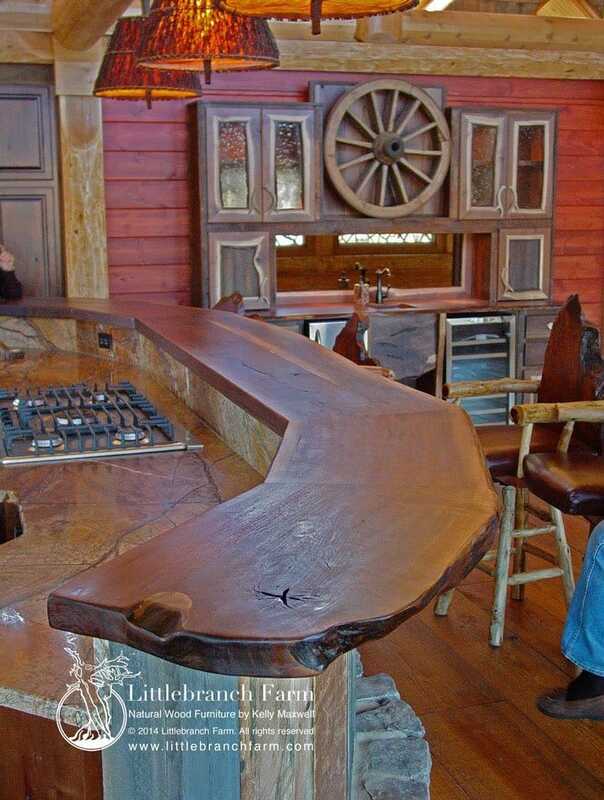 This one of a kind redwood wood slab is featured as the bar top. Natural wood countertop crafted from a live edge claro walnut slab. 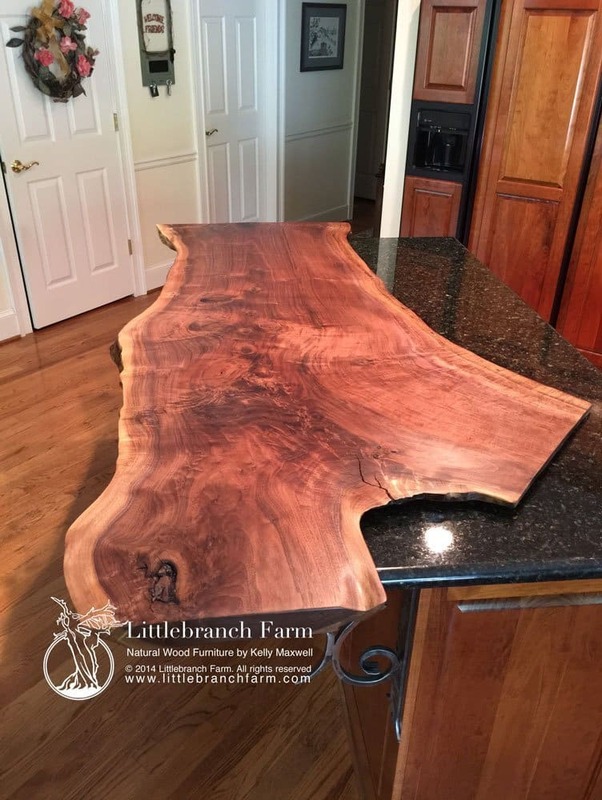 Black walnut Live edge wood slab crafted as an overlay countertop. Features hand-forged corbels as support. Butcher block wood countertop in a contemporary kitchen with food safe finish. Features wide plank black walnut. Wood countertop built from old growth redwood with exotic curly wood grain and natural raw edge. A natural wood countertop built from spalted maple. Features a unique quilting wood grain. Wood slab countertop highlights old growth curly redwood wood slabs. 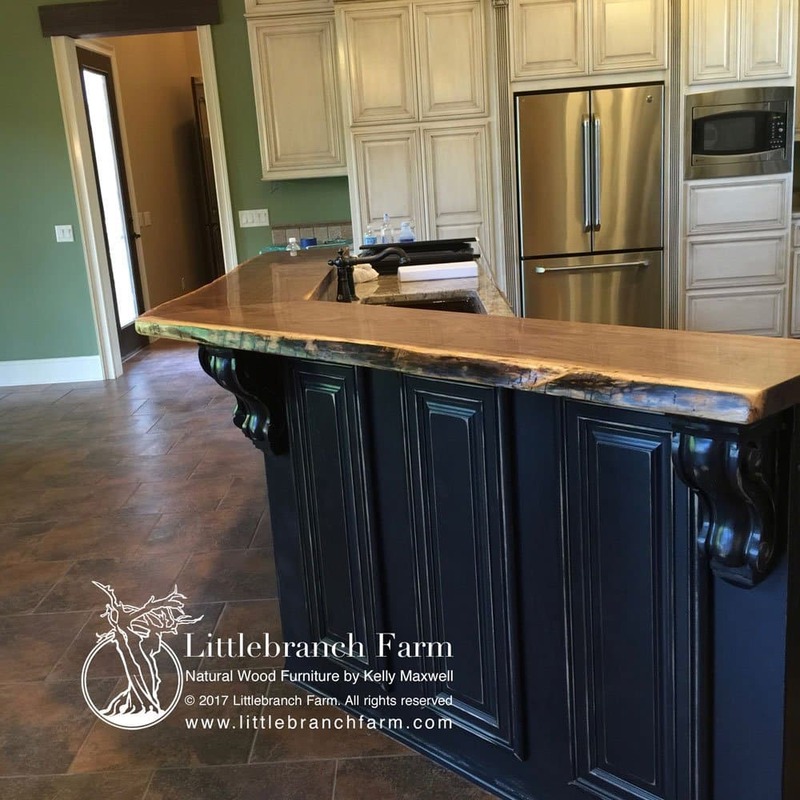 Custom solid wood slab island with a raw edge wood. 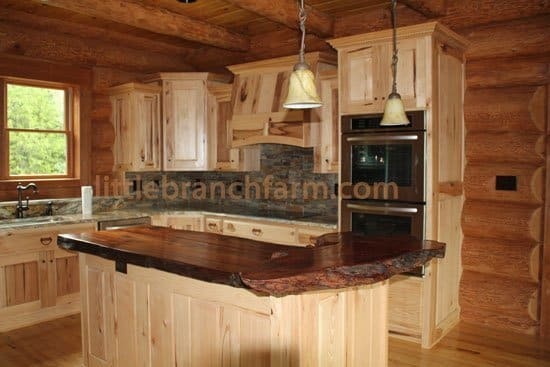 Also, this stunning 16′ by 4′ old growth raw edge wood countertop is supported by custom cabinets with log trim. 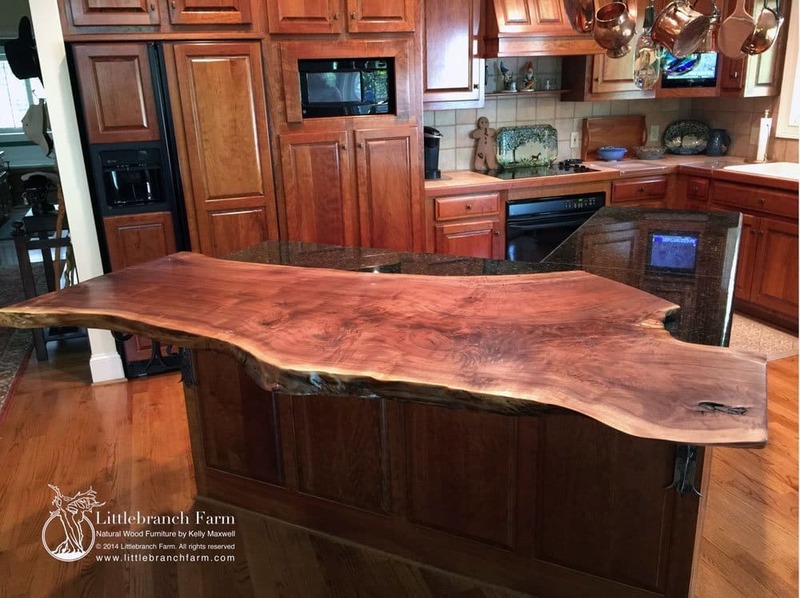 Live edge wood countertop crafted from old growth redwood slab. The project is also accented with twisted juniper columns. Raw edge wood countertop built with a redwood wood slab. Unique slab wood countertop with a natural live edge and deep color tones, burl, curl and knots. 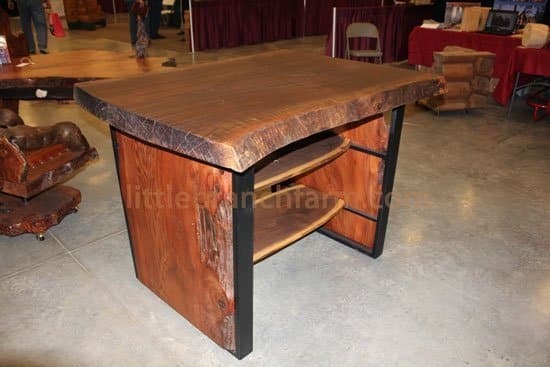 Salvaged redwood used in this custom furniture. 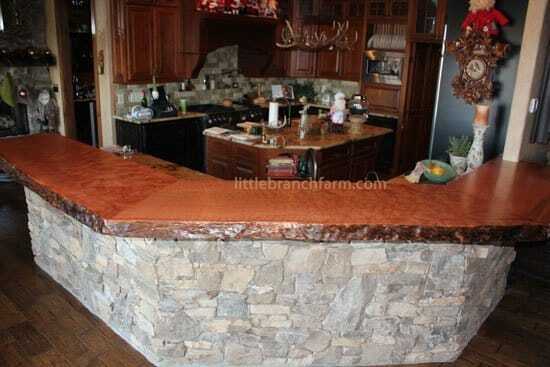 Natural wood countertops handcrafted using a burl wood slab cut from a salvaged redwood root. This unique wood slab has great color tones, curly and other wood grain pattern. 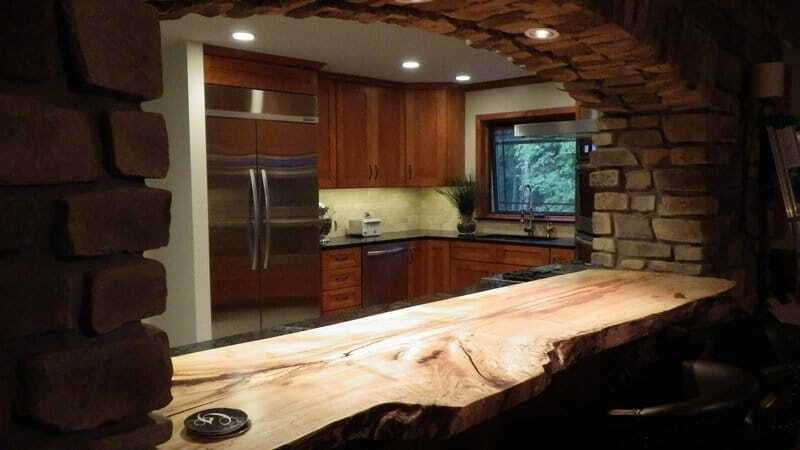 The natural wood countertops were crafted using a salvaged old growth redwood root system. Our natural wood countertop is crafted from reclaimed, salvaged old growth redwood or dead standing walnut trees that have lived their life. 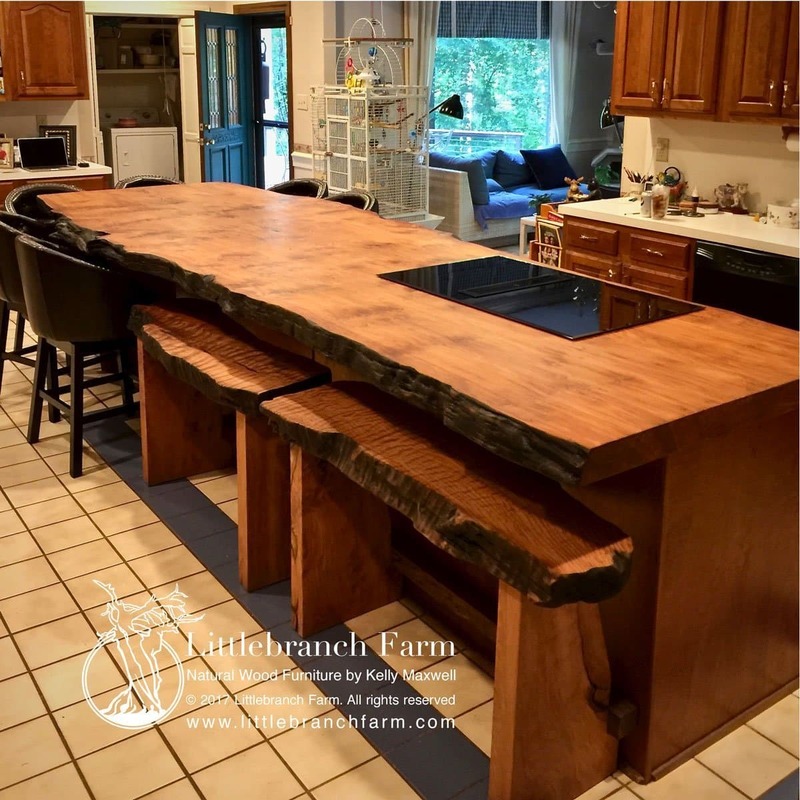 The featured wood countertop features a black live edge. 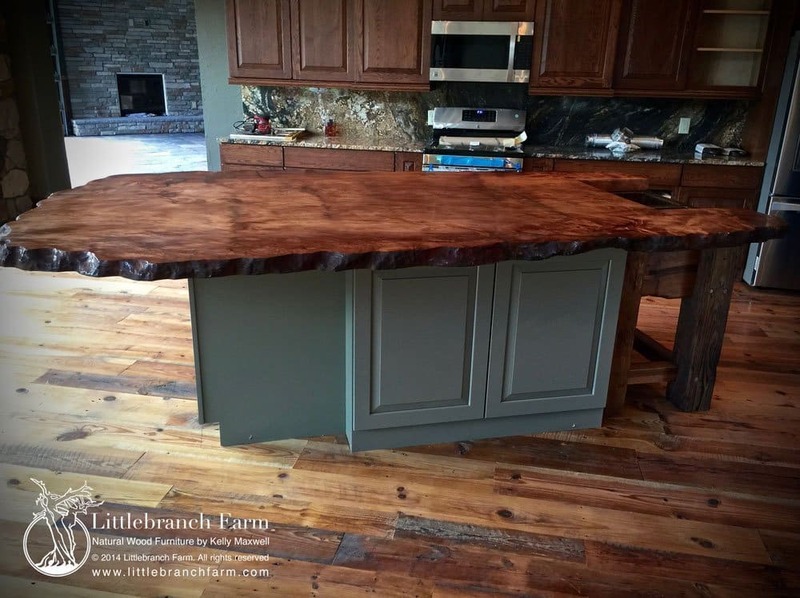 Natural wood countertops with natural live edge featured on rustic knotty hickory cabinets. Created by Kelly Maxwell. 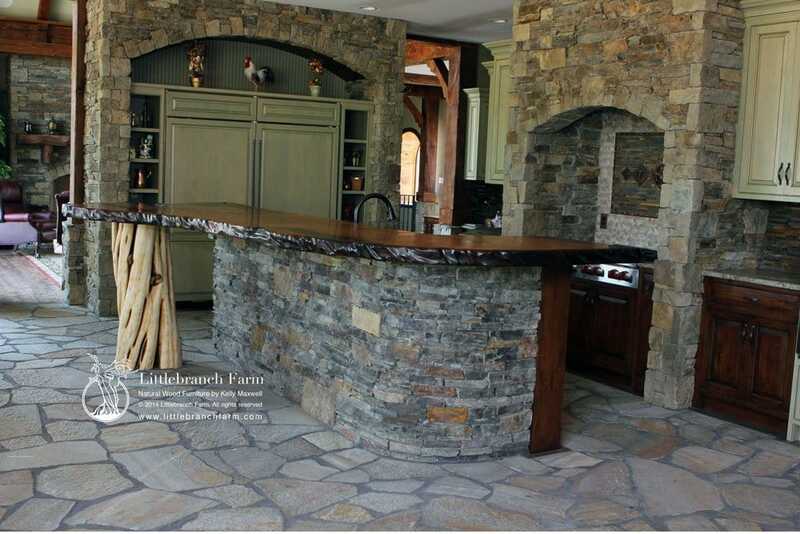 Natural Wood countertops design and crafted as a multi-function wood slab table. The base is a solid metal base with redwood slabs accenting the ends with simple black walnut shelves. 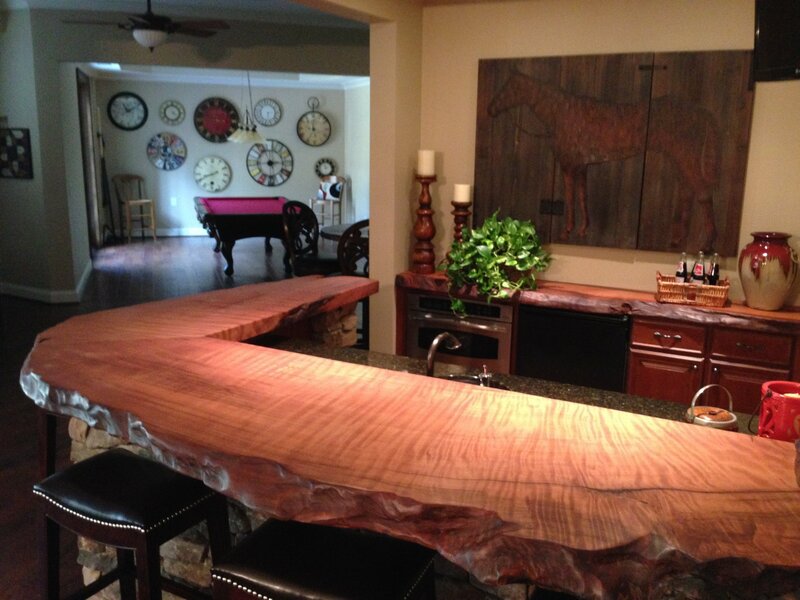 The top is 60″ by 40″ curly black walnut slab with a natural live edge on two sides. The top is finished with a food-safe mineral oil so it could be used as a kitchen prep area. We use a waterproof hand-rubbed finish that becomes part of the wood and expands and contracts with the wood. The pictured projects are examples of some of our work. Please call or fill out the information form and submit below. 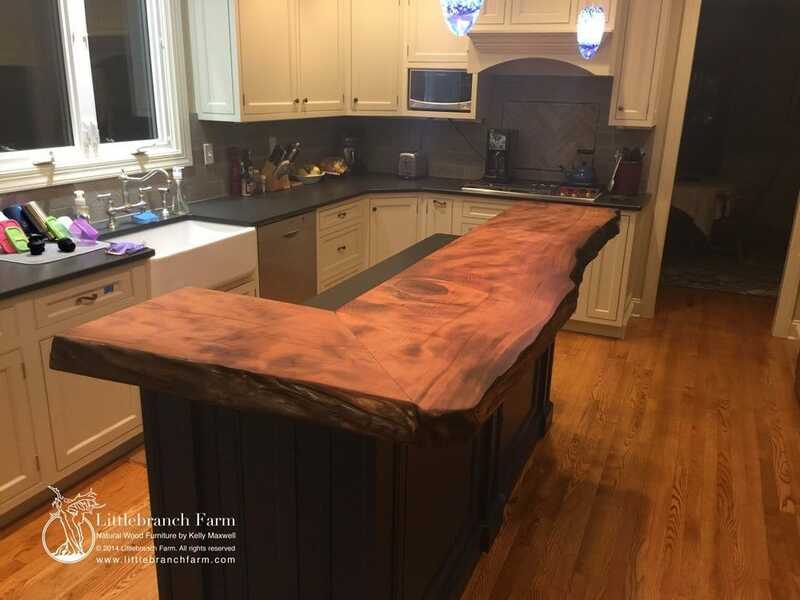 Massive live edge redwood countertop with a charred live edge and burl wood grain pattern. 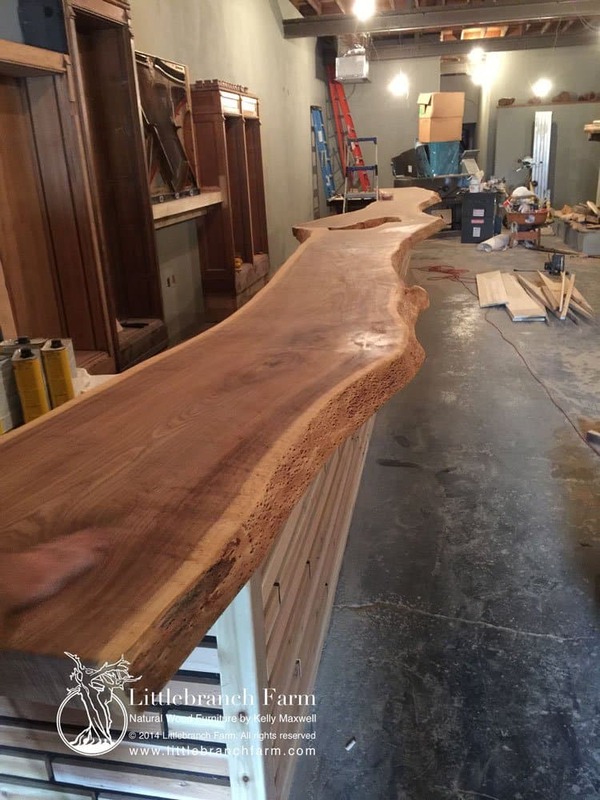 Also, this wood countertop is 160″ long by 56″ wide and almost 3″ thick. Great gathering area and conversation pieces. 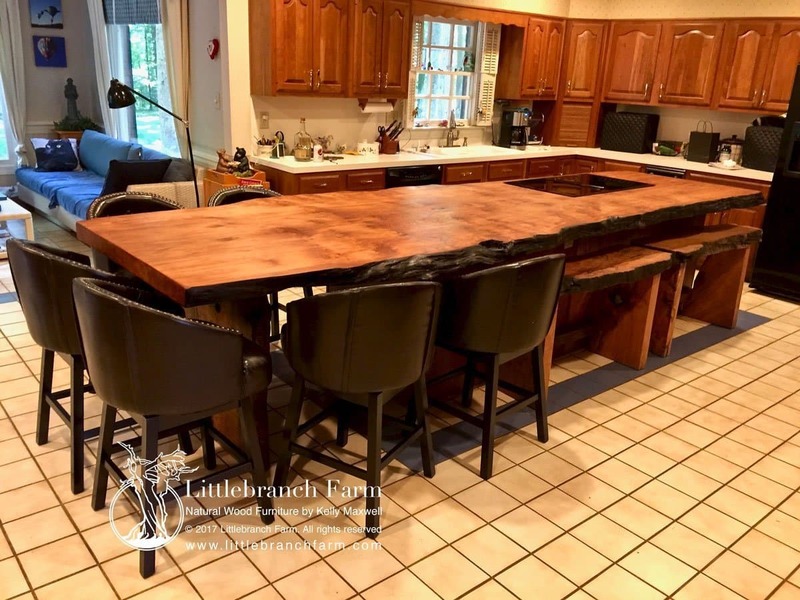 This live edge wood countertop with custom double barstool benches. 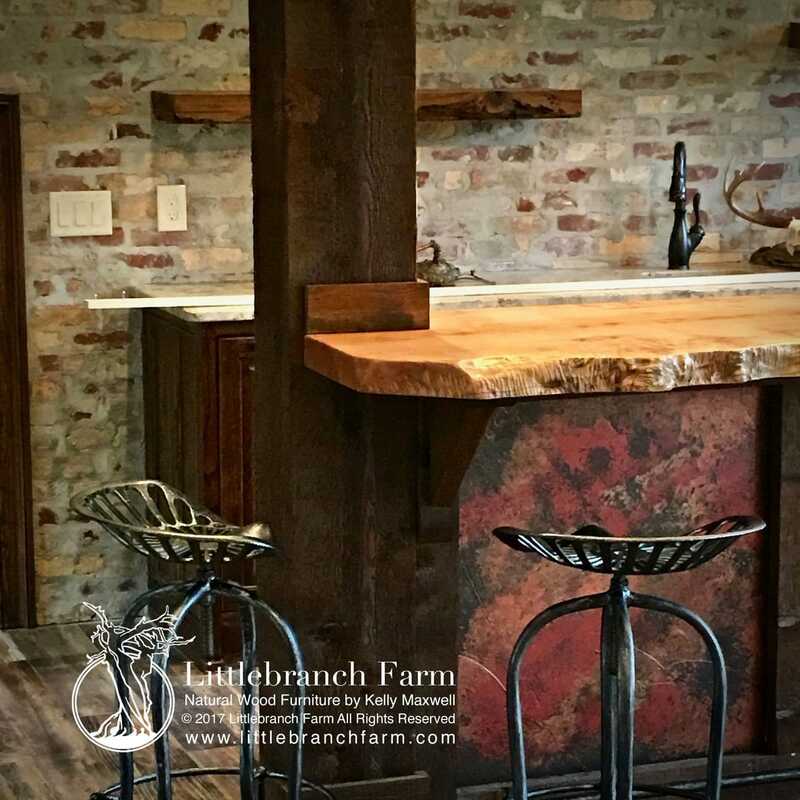 Our custom furniture makers also design and build our rustic style live edge furniture. These barstool benches are examples of their craftsmanship.